Natural woven burlap is classically simple yet elegant, lending earthiness to the drum shade on this clear glass table lamp. A clear glass candlestick style base makes this transitional table lamp sparkle. The design features a stylish made-to-order woven burlap fabric shade that’s hand-assembled by our artisans in California. Chrome finish details, stand, and finial complete this attractive look. 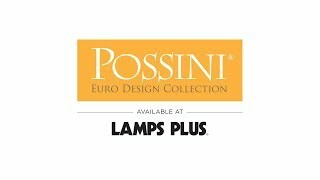 Clear glass table lamp by Possini Euro Design®. Hand-assembled shade; Woven burlap shade material.